"Smartmatic is responsible for technical services and nothing else," she added. 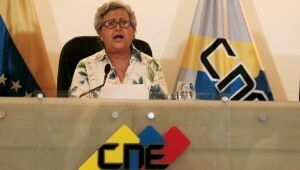 CARACAS - The president of the National Electoral Council (CNE), Tibisay Lucena, hit back at SmartMatic after the head of the company claimed the July 30 National Constituent Assembly (ANC) vote was "manipulated." "It is an irresponsible assertion based on estimates without any basis in the data that is exclusively managed by the Electoral Authority. But even more serious, Smartmatic participated in all (pre-election) audits," Lucena said. "SmartMatic's allegations represent an unprecedented view of a service-only company ... Smartmatic is responsible for technical services and nothing else," she added. The statements come after Smartmatic director, Antonio Mugica told a press conference that they had detected "manipulation of the participation data" during the ANC vote, where the CNE says over 8 million Venezuelans voted. Smartmatic, a Venezuelan-based multinational that has provided the technological platform for voting and services for the Venezuelan elections since 2004, claim to have identified "a difference between the announced figure and the number produced by the system is at least one million voters." Mugica confirmed Smartmatic had not discussed the allegations with the Venezuelan government and the electoral authorities prior to holding their press conference Wednesday. The company executive did not specify the basis for their numbers, or how these were obtained. In 2013, Mugica told CNN that it was "virtually impossible" to manipulate votes using his company's technology. On Sunday millions of Venezuelans turned out to vote for the 545 members of the Constituent Assembly who will be charged with drafting the text for a new constitution that will require approval by popular vote. The opposition MUD coalition, which has been leading violent street demonstrations since early April, vowed to stop the vote through a boycott and called on supporters to block roads so as to stop others from voting. Lucena said electoral authorities had to relocate 1,200 voting centers as a result, and some 200 polling stations were attacked. The U.S. government responded to the Constituent Assembly vote by placing further sanctions on Venezuela, including on President Nicolas Maduro. "By sanctioning Maduro, the United States makes clear our opposition to the policies of his regime and our support for the people of Venezuela who seek to return their country to a full and prosperous democracy," said Secretary of the Treasury Steven T. Mnuchin. he added.